In collaboration with Xabier Barandiaran, we have embarked some years ago in what at first looked like a simple exercise in map-making. We encountered such different reactions when we mentioned our interest in the concept of habit that it was clear that the word meant very different things to different people. Cognitive scientists and neuroscientists immediately think of habits as blind automatisms, psychologists and psychotherapists think of them as remnants of a developmental history, while social scientists think of them as self-sustaining normative structures of the life world. We thought it would be relatively easy to disentangle these different meanings and connotations of the term. In fact, we found a rich and ever-expanding network of ideas, influences, nuances, expansions and reductions of concepts and even rejections of the notion(s) of habit. The result is the following map. 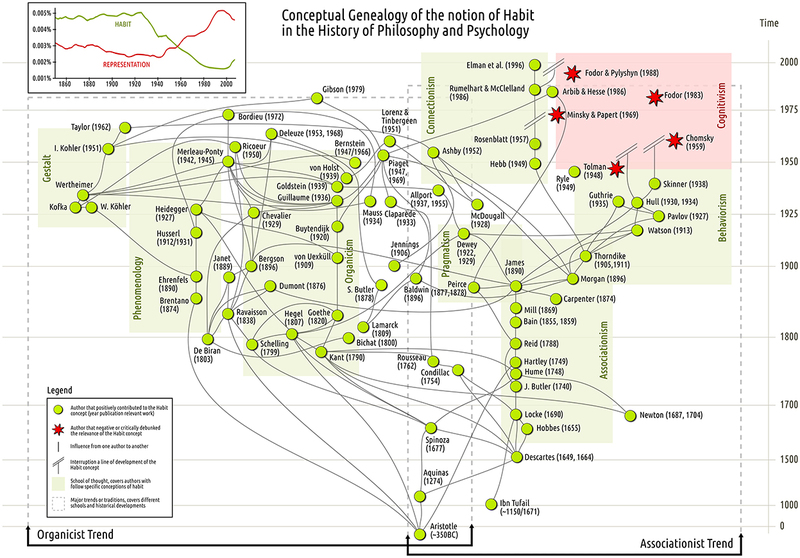 Barandiaran XE and Di Paolo EA (2014) A genealogical map of the concept of habit. Front. Hum. Neurosci. 8:522. doi: 10.3389/fnhum.2014.00522. And you can find the map in other formats following this link: http://barandiaran.net/design/habit-map. As we suggest towards the end of our mini-review, we think that the time is ripe of a modern notion of habit, not as blind automatisms but as sophisticated, adaptive and self-sustaining structures of sense-making, to re-enter the discourse in psychology, neuroscience and embodied cognitive science.